As a young man serving in the Marines during the Vietnam War, George Sullivan envisioned a career in the military. A mission to help rescue the crew of a downed helicopter altered that path, changing his life forever. Stationed in Dông Hà as a member of Lima Company, 3rd Battalion, 4th Marine Regiment, Mr. Sullivan was wounded during a long firefight on the rescue mission. He was hit by enemy fire at least seven times but managed to survive. He was transported to Saigon, then flown to Japan and later, Alaska, to return to the United States. “It’s sort of a blur, but I do remember it distinctly,” said Mr. Sullivan, who lives in Southold and is now 72. After several operations to save his left leg, including the replacement of an artery with a vein that eventually failed, doctors were forced to amputate. Mr. Sullivan was one of nearly 500 Marines wounded during a few months in 1967 as part of Operation Prairie II. He survived with a story to tell, and his voice will now forever be heard as part of the American Veterans Disabled for Life Memorial in Washington, D.C. The memorial, located adjacent to the National Mall and within steps of the U.S. Capitol, honors more than 4 million veterans from all wars who returned home permanently disabled. The memorial features glass panels engraved with “Voices of the Veterans” — quotes from disabled veterans detailing their experiences, including one from Mr. Sullivan. The concept of the memorial dates back to 1998, when the Disabled Veterans Life Memorial Foundation was established. It took over a decade for legislation, fundraising and construction to all come together and make the memorial a reality. It was officially dedicated in October 2014. Mr. Sullivan, who was awarded the Navy Cross, the country’s second-highest military decoration, had hoped to view the memorial for the first time this year while attending his 50th reunion with the Marines. But health concerns have prevented him from traveling. Megan Collins, Mr. Sullivan’s daughter, recently brought her three children to D.C. to see the memorial for the first time. It was an especially proud moment for her to see her oldest son’s reaction. Kevin, 7, will often listen to his grandfather talk about history. Ms. Collins said that after seeing the memorial, Kevin couldn’t wait to return home to talk to his grandfather about it. “It was a proud moment for both of us,” she said. How Mr. Sullivan’s quote came to be part of the memorial dates back more than a decade. He had been interviewed at length about his experience as part of a project to record an oral history of the Vietnam War. Mr. Sullivan said the government had never sought out veterans from World War I or II in that way and didn’t want to miss the opportunity again. The interview, Mr. Sullivan was told, would be entered into the Library of Congress. Years later, a quote from it was ultimately selected for inclusion in the memorial. “I was honored to be selected,” he said. Mr. Sullivan’s son, Bob, who now lives in South Carolina, was the first family member to see the memorial in person at the end of last year. 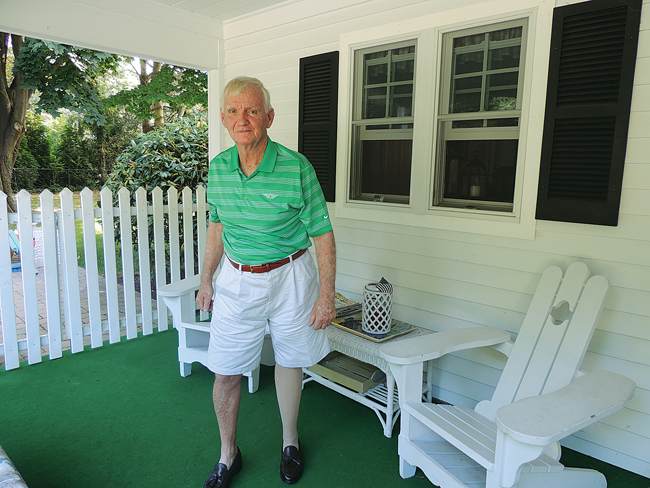 Mr. Sullivan has lived in Southold since 1973. He transitioned from his military career to owning an accounting practice, which he ran until 1999. He’s served as the town’s receiver of taxes for more than two decades. He’s also belonged to the American Legion for more than 40 years and in 2014 was voted commander, a post he held until he suffered a heart attack that December. While recovering from the insertion of a stent, he contracted pneumonia twice and nearly died. About a year ago, he underwent bypass surgery. It’s been a long recovery for Mr. Sullivan, who is still undergoing physical therapy. He hopes to get back on the golf course soon. While he hasn’t seen his contribution to the veteran’s memorial yet, Mr. Sullivan will be honored another way later this month. The New York Mets have invited him to attend a game Aug. 27 as a military guest of honor. A lifelong Mets fan who attended Game 7 of the 1986 World Series, Mr. Sullivan said he has been introduced to Mets general manager Sandy Alderson on several occasions. Mr. Alderson also served in Vietnam as a Marine.